As a child, my mother would always make pound cakes for us. We would eat a slice or two for breakfast and as an after-school snack. Every time we opened up the “magic cake box”, as my sister called it, sure enough, there would be some kind of cake – plain, with cherries, marble…even peppermint-flavoured! Ever since, pound and butter cakes have been my favourite – easy to make, buttery, dense and moist cakes that aren’t overly sweet and can be eaten any time of the day. You can also make many variations on the basic recipe by adding things like orange or lemon zest, poppy seeds, or frosting the finished cake. 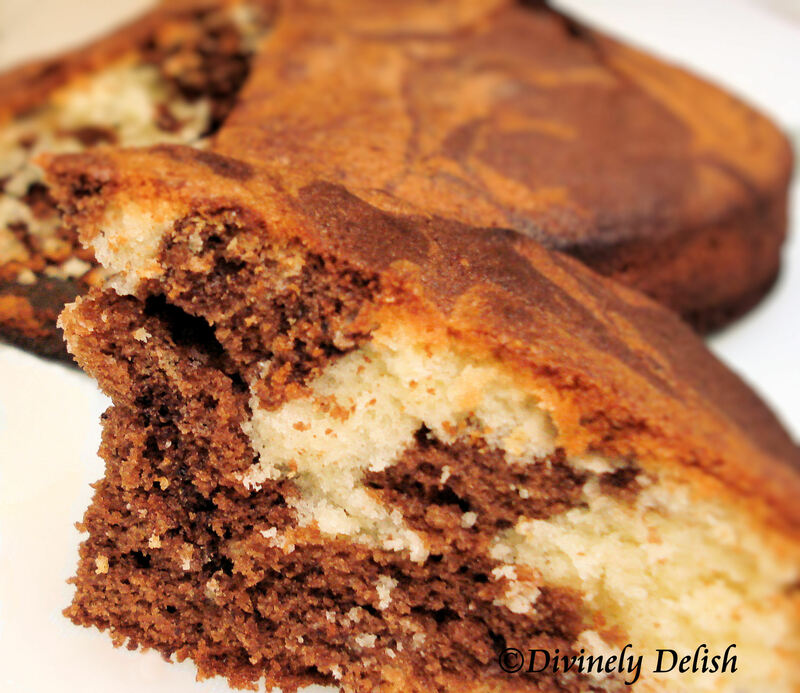 In my search for a good marble cake recipe, I came across a highly rated one from BBC Good Food Magazine. Eating this definitely brought back memories of my childhood! 1. Heat oven to 180C (356F). Grease a 20cm (8-inch) cake tin. If you want to make life easy, simply put all the ingredients (except the cocoa powder) into a food processor and whizz for 1-2 mins until smooth. If you prefer to mix by hand, beat the butter and sugar together, then add the eggs, one at a time, mixing well after each addition. Fold through the flour, milk and vanilla extract until the mixture is smooth. 2. Divide the mixture between 2 bowls. Stir the cocoa powder into the mixture in one of the bowls. Take 2 spoons and use them to dollop the chocolate and vanilla cake mixes into the tin alternately. When all the mixture has been used up (and if young kids are doing this, you’ll need to ensure the base of the tin is fairly evenly covered), tap the bottom on your work surface to ensure that there aren’t any air bubbles. Take a skewer and swirl it around the mixture in the tin a few times to create a marbled effect.